An uncle is asked to take care of his teenage nephew after the boy’s father dies. 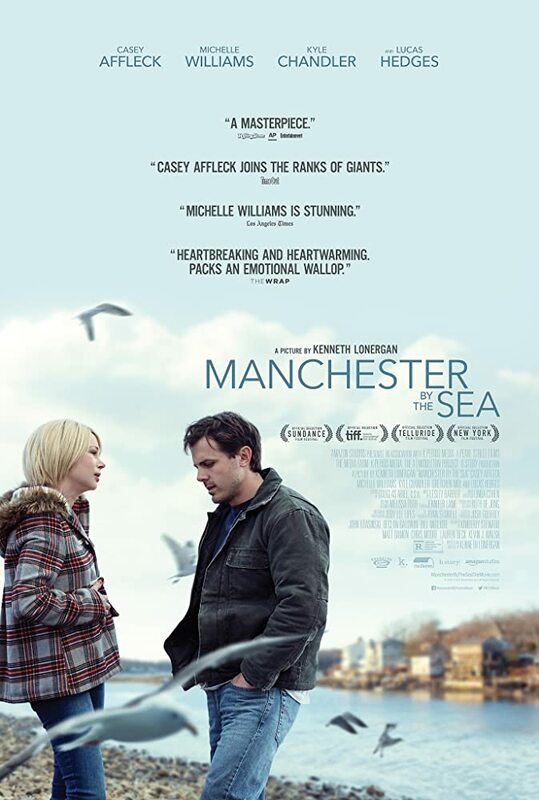 THE REVIEW: I actually saw Manchester by the Sea a few weeks ago and am just getting to writing my review for it now (there’s still more than a week until the Oscars…). Despite the time that has passed since when I’ve watched it and now, there’s still a lot about the film that has stuck with me, which is a good sign for any film. Perhaps what struck me most about Manchester by the Sea wasn’t necessarily the acting per se, but how the film was put together. It is a film that is ruled by awkwardness and awkward pauses. It is so prevalent that it’s distracting at the beginning of the film but becomes part of its endearment long before the end of the film. Casey Affleck and Lucas Hedges give terrific performances as Lee and Patrick Chandler, uncle and nephew, in that they convey the essence of the film. At its heart, Manchester by the Sea can be a very sad, depressing, and extremely pessimistic film. It is a story about a dysfunctional family that has been met with tragedy after misfortune and is trying to figure how to proceed. These events have damaged the players in the story — probably none more so than Lee (Casey Affleck) — and the film shows what kind of an impact it can have on people. The most tangible example of this is that awkwardness. It seems manufactured at the beginning, as in, “Why are there all these long pauses in between character’s lines?” But it soon becomes apparent that it’s just who these characters are — a result of the experiences they’ve had in their lives. Lee shuns personal and emotional relationships because he’s been burned (pardon the word choice here, for those who have seen the film) in the past and his solution is to avoid future attachments. Patrick tries an opposite approach and goes for the “bite off more than you can chew” tactic. Others — namely Randi (Michelle Williams), Lee’s ex-wife — seem to be filled with regret for everything that’s happened in the past and are unsatisfied with where they are despite projecting an image to the contrary. Manchester by the Sea is not a happy film. And the reason it’s so good and really makes an impact isn’t just because it’s a sad film, something we rarely see. It’s a great film because it doesn’t blatantly call attention to that fact; it merely presents its characters and stories and progresses from there. It’s less of a tragedy than it is a depiction of a certain family and their story. Yes, it also happens to be sad and tragic at the same time. In terms of it’s Oscar potential, it was nominated for six awards including Best Picture, Director, Actor, and Original Screenplay but it seems unlikely it’ll win any (although I’ll have my full predictions closer to February 26). Arrival is still my personal favorite for most of those categories, but Manchester by the Sea would be my second favorite or tied for second with the also-great Moonlight — I’m just pretty anti-La La Land despite it looking poised to go home with lots of gold.